WOW….my phone went off Sunday morning with that familiar little sound which meant a text had landed in my stream of life. I poured my cup of coffee and opened the message…oh, my what a gorgeous face was staring back at me. It was Esther, my precious niece in Asheville, NC., my brother’s daughter who carries so much of his joy, spirit and compassion. She had spent Saturday taking her senior pictures at the camp where she works during the summer…OH, her face is gorgeous, her hair a mane of golden curls, her smile so radiant. She is on a bench and the word “courage” is etched under her elbows. She is smiling and glowing. You can see her Healing Knots bracelet. This picture says it all. She is my model of courage. She is what Healing Knots stands for…love, acceptance, healing, loss and resilience. The courage to face tragic loss of a parent and bring that loss into a place of grace, beauty and action. Esther’s compassion, beauty, joy for life and pure spirit radiates from this picture. Her mother, Chris, sent me a note…"Corinne this picture needs a blog." She is right. ….keep reading. She wrote some powerful words of what this photo meant to her. 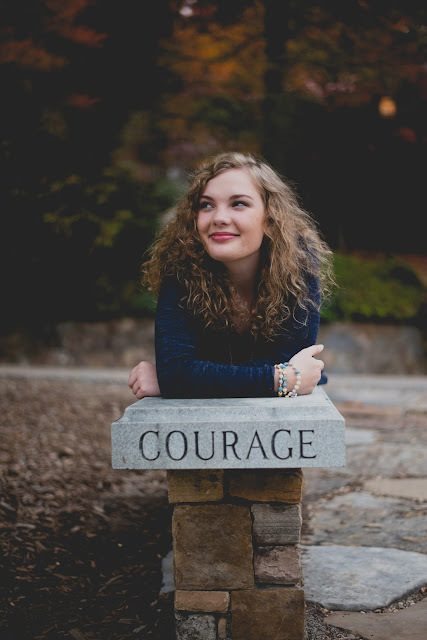 Words from Chris Pruitt O’Steen…courage comes in all different sizes. Chris has courage that I will write about one day, too. Hope these words inspire you. When we share from our own heart, we touch others hearts and together we all heal. We need you to get better, Dad,” Esther told him. It was a mild fall day, one of those days when the air feels soft and gentle, no bite of cold yet. The cherry trees were half-naked already, their leaves strewn about on the road in front of our house. Esther and Keith were on a little neighborhood walk. She was thirteen. “I know, Esther. I want to. I really do,” was all he could say. He didn’t look at her, or take her hand. He was absent already, disconnected. Depression gripped him, drained his mind of all that was good in the world, filling him with an anxious dread, a darkness we couldn’t understand. We all wanted to shake him out of it, to get him back, and none of us more than Esther, his firstborn, his only girl, his delight. Keith was her confidant, her entertainer, her source of great music and dumb jokes and beautiful stories and big bear hugs. She needed him to get better. All that was funny and original and musical and beautiful about her dad was faded. He had become a shaken, discouraged man, just a shell of who he really was. A year later, the deceiving voice of depression drowning out the truth of love and hope, he succumbed to his illness. Yesterday Esther and I visited the girls’ camp where she has spent her summers since third grade. The place was empty and silent, devoid of the chatter and activity of campers, as if it were resting. It was a mild October day, the air soft. Four years have passed since her neighborhood walk with Keith. Four years. She is a senior in high school now, this beautiful young lady, and so full of life and joy and friendship and grace. Sorrow has made her gentle and kind. Memories of her dad’s love are rooted deep and sweet in her heart. Courage. Oh, yes. Courage etched in marble, set upon stone. That’s the kind of courage you’re made of, my dear girl.